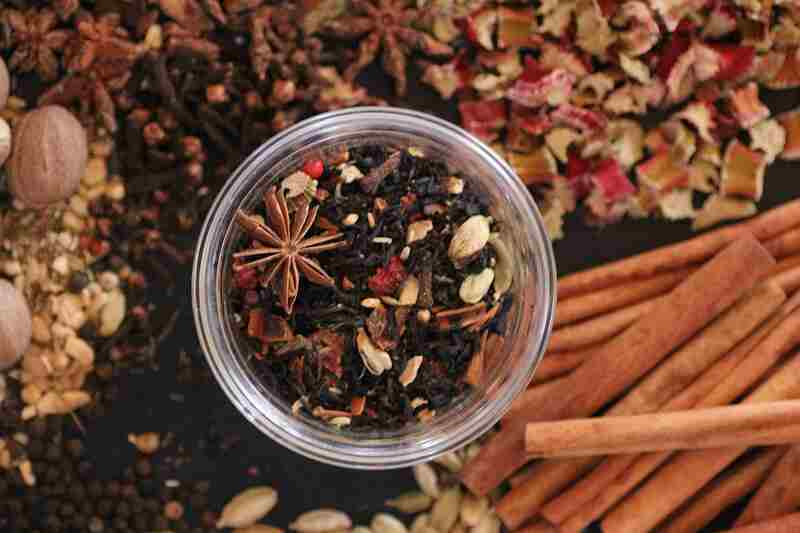 Winter is the time of mulled spices and warming comfort, and masala chai offers all of that! For centuries we have celebrated and created rituals around tea. It is a communion with nature and ourselves and offers a warm welcome to those that sit at our hearth. Masala chai is a rather modern recipe but its roots are ancient. Packed with aromatic herbs and spices that support good health, this sweetened, milky spiced tea is a perfect holiday beverage. Although there are various stories about how Chai originated it is said to be deeply integrated within the traditions of Ayurvedic culture. In Hindi and several other Indian languages, ‘masala’ means ‘spices’ and ‘chai’ means ‘tea’. Chai was historically used for medicinal purposes. It was a blend of spices infused in hot water. The spices selected varied by ailment, region and availability. Wild tea plants are native to the Assam region of India. This was noticed by British colonists in the 1830s, who began to encourage cultivation of the plant through the establishment of large tea plantations. 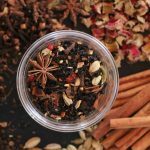 It wasn’t until the early 20th century that chai would evolve into the widely popular, deliciously spicy drink that we all love. In order to make tea more popular, the Indian Tea Association encouraged employers to provide staff with tea breaks. To provide this service, independent tea vendors (called chaiwala) popped up everywhere. They soon took to substituting some of the tea leaves with spices and a high volume of milk and sugar, to reduce costs. The tea company discouraged this because it meant less profits for them but by then the drink had become too popular. Tea drinkers and chaiwala kept making and drinking the sweet, spicy, milky chai and the rest is history. 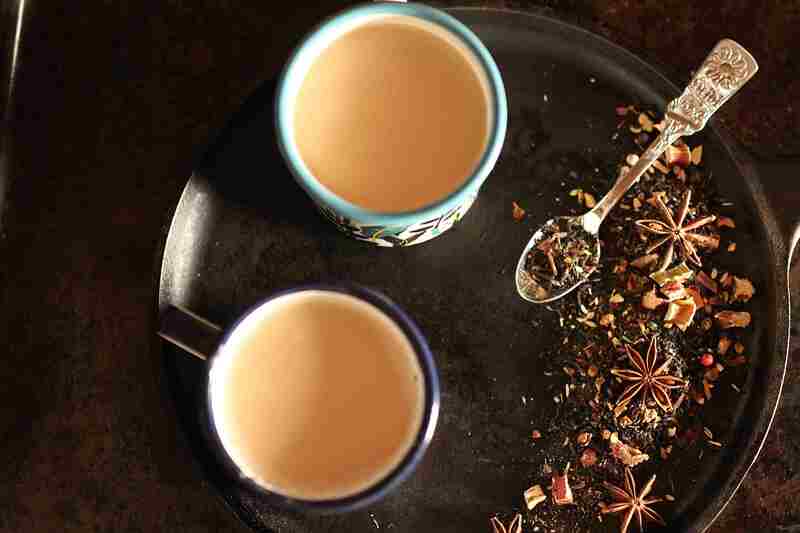 There are many variations of chai, each family and region having their own subtly unique blends. The one thing they all share is that masala chai is packed with powerful spices that supports good health. The traditional base ingredients are: cardamom, cinnamon, ginger, cloves, and pepper. The rule of thumb is 1 Teaspoon of tea for every 6oz of water. You’ll want to serve it sweetened with honey (or sugar) this really brings out the flavours of those spices. Pouring a generous helping of frothed cream into your cup = the perfect chai! We dehydrate fruits, herbs, rosehips and other things for teas. I decided to give our most recent batch of chai a little twist and we loved it. 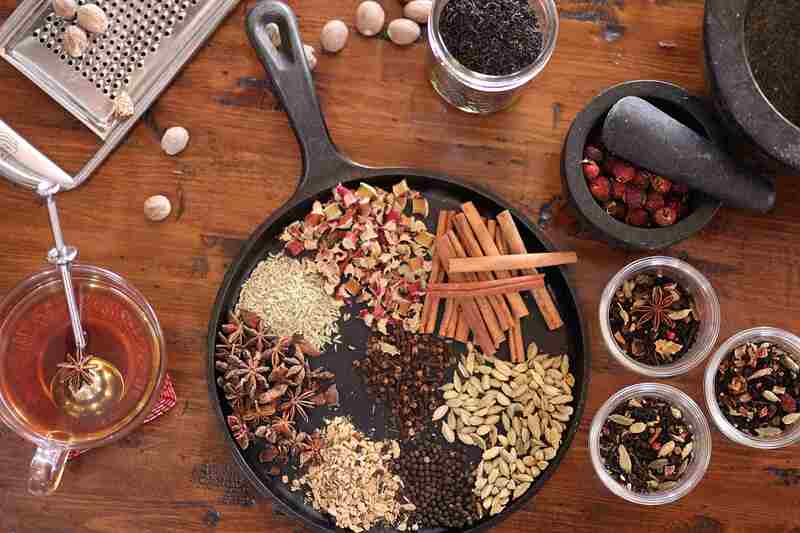 Grind up the spices using a spice grinder or mortar and pestle into small pieces; they will infuse better that way. Reserve some spices and leave them whole. I like to leave some of the spices whole or chunky because they look gorgeous that way. Pour the black tea into a jar and add the crushed up spices. Add the whole spices, affix a lid on the jar and shake well. 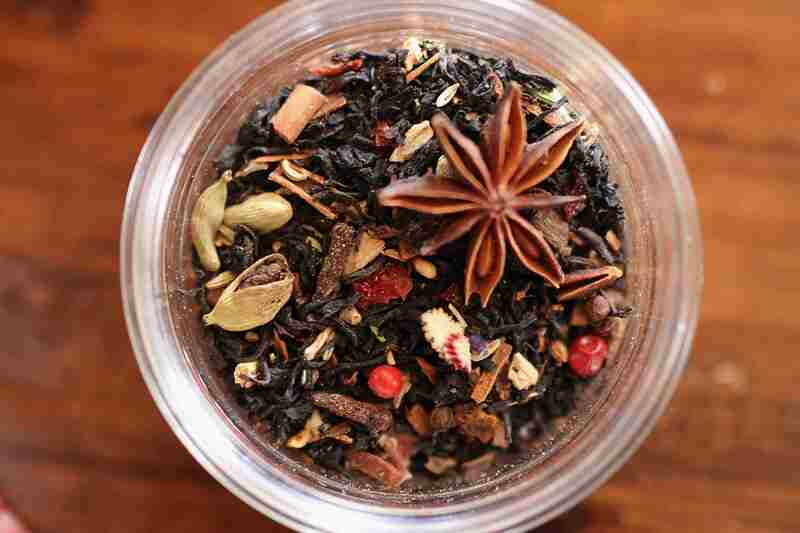 If gifting, pour the tea blend into your chosen containers, sprinkle some whole seeds on the top (if desired.) A whole aniseed looks quite lovely on the top as do red peppercorns. Label your jars and that’s it! Masala Chai benefits from a long steep. This ensures that you are getting all of the lovely spicy flavours, oils and benefits from all of those spices. There are a few ways to achieve this conveniently. Cover the tea with boiling water and allow it to steep overnight in the refrigerator. Strain, warm it up and serve with frothed up milk and honey. Create a decoction. 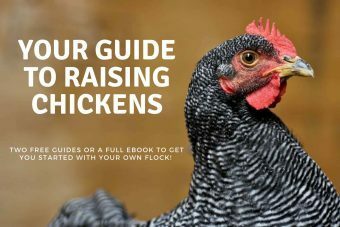 This is simply a method of extracting more flavours and benefits without having to wait so long. Place the tea in a pot cover with water, bring to a boil. Place the lid on the pot and reduce the hear to a simmer. Simmer for 15 minutes and allow to steep for 15-30 minutes, depending on how strong you like your brews. The longer you steep the more flavour and medicinal properties will be released from the herbs. Mason jars, tin containers or waxed paper bags are ideal for packaging teas. You can even get really fancy and use fillable individual tea bags! You can look for little wooden scoops and tea infusers and affix those to the packaging as well. Always label your gifted teas with the ingredients and the date. Providing the ingredients is just good practice when giving herbal items to others. You should also provide usage instructions. Black tea comes from the leaves of the Tea Plant (Camellia sinensis). This is an evergreen Shrub that grows in tropical and sub tropical climates. Green tea is made from the steamed and dried leaves, whilst black tea is made from leaves that have been fermented and then dried. The tea plant is commonly used in Chinese herbalism, where it is considered to be one of the 50 fundamental herbs. Black tea has a stimulant effect due to caffeine. Modern research has shown that there are numerous health benefits to drinking tea, include its antiviral, digestive and antioxidant properties. Sweet, aromatic and also spicy cardamom (Elettaria cardamomum) is popularly known as ‘Queen of Spices’, It is the dried fruit of a tall perennial herbaceous plant. Related to ginger, cardamom is one of the world’s most expensive spices, after saffron and vanilla. (2). It can aide in digestion, support the immune system, assist with poor appetite, diarrhea, coughs and muscular spasms. Pungently sweet, the name cinnamon (Cinnamomum verum) refers to the tropical evergreen tree as well as the bark that is extracted from the plant. The volatile oils in cinnamon are antifungal and antibacterial and can also aide in digestion. In Ayurvedic medicine, cinnamon is used against a wide range of ailments such as, bronchitis, colds, congestion & diarrhoea. It can also be an aide for gas, indigestion muscle tension, nausea and vomiting. The bittersweet clove (Syzygium aromaticum) is a medium sized evergreen indigenous to certain volcanic islands of North Molucca, in the eastern part of Indonesia. Clove has long been used in traditional medicine, particularly to aid digestion, cure stomach disorders and in pain relief. It has strong anti-microbial properties. Sweet and mildly bitter, with a licorice like taste, fennel (Foeniculum vulgare) is a herbaceous flowing herb. Fennel is traditionally regarded as a digestive aide. It can help ease uncomfortable feelings of fullness, bloating or gassiness. In ancient Ayurveda fennel is considered nourishing to the brain and eyes, and calming to the spirit. Ginger is obtained from the underground stems or rhizomes of Zingiber officinale. It is a herbaceous tropical perennial belonging to the family Zingiberaceae. Ginger offers circulatory and digestive properties and is a popular remedy for nausea. Ginger is warming, stimulates the immune system and also has excellent antioxidant properties. Nutmeg is the fruit of the nutmeg tree (Myristicaceae). The nutmeg tree is indigenous to the Banda islands in the Moluccas. Warm, spicy, sweet, it has been used for centuries to ease the digestive discomfort. It is also a warming and immune system stimulant. Information offered on walkerland is for educational purposes only. 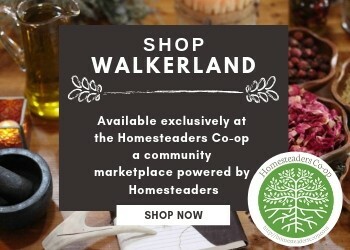 Walkerland makes neither medical claim, nor intends to diagnose or treat medical conditions. Links to external sites are for informational purposes only. We neither endorses them nor are we in any way responsible for their content. Readers must do their own research concerning the safety and usage of any herbs or supplements. Label your jars and that's it!